Because last week he ruled the deal could not be brought back to the Commons for a third time without "substantial" changes. Mr Bercow's intervention today suggests he doesn't think that test has yet been met. It's clear the date of Brexit has changed too. It will be 22 May if the withdrawal agreement is passed by the Commons this week and 12 April if not - unless there is a further extension. The government was considering a procedural move that could have proved MPs wanted to have a vote, regardless of the parliamentary convention. But John Bercow said that wouldn't do. Hannah White from the Institute for Government said that while the Speaker is the ultimate authority on parliamentary procedure, "the government ought to be allowed to test the will of the House on whether to set aside its own rule". 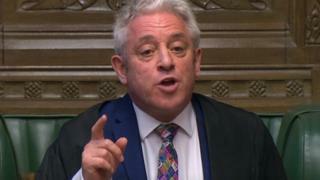 It is possible the government attempts to pass the withdrawal agreement on its own - detaching the non-binding political agreement MPs are arguing over now from the terms of divorce. That may well satisfy the EU's deadline and allow MPs time to continue their wrangle over the sort of future relationship they want after Brexit.